I love legumes. They are an excellent protein source and healthy substitute for meat, which is higher in fat and cholesterol. These tasty legumes are loaded with iron, magnesium, potassium, B vitamins, and soluble fiber. Here is an easy and healthy recipe for all year round! Heat the olive oil at medium heat in a pan with hard bottom. Add the onion, garlic, celery and green pepper and stir-fry for 10-12 minutes or until they are soft and start having a nice color. Add the spices and cook for 2-3 minutes stirring frequently. Add the tomato sauce, the broth, lentils and chickpeas and bring to a boil. 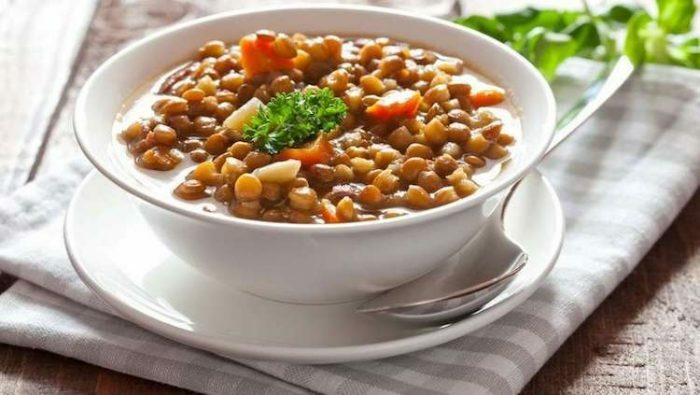 Reduce the heat, cover and cook a slow heat for about 20 minutes or until the lentils are cooked. Salt and pepper to taste. Serve the mix in bowls and sprinkle the cilantro. Serve immediately with brown rice.